Australia's World Cup final tactics have been leaked after staff were pictured with their game plans in hand. 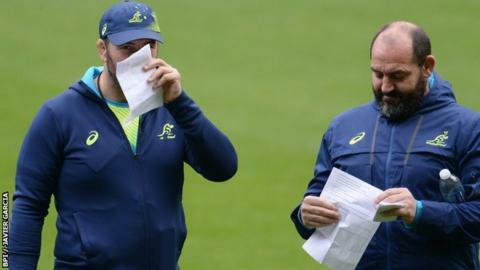 Head coach Michael Cheika and assistant Mario Ledesma were spotted holding the pieces of paper at Friday's captain's run at Twickenham, before Saturday's final against holders New Zealand. Among the instructions were to "expose" All Blacks wings Nehe Milner-Skudder and Julian Savea under the high ball. They were also told to "rattle" Kiwi number eight Kieran Read at restarts. Australia are looking for their third World Cup title, but have lost 20 out of their last 25 meetings with the All Blacks.